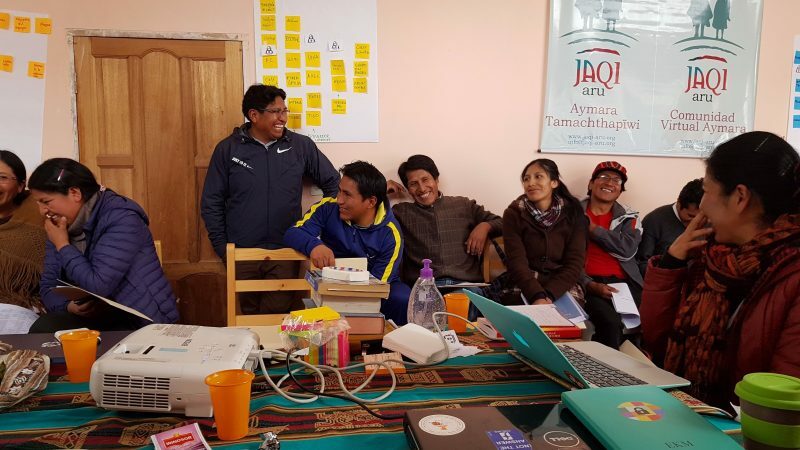 Localization Sprint with Jaqi Aru and the Aymara language team in El Alto, Bolivia. Photo by Localization Lab. Used with permission. Rising Voices is republishing articles from Localization Lab contributors as part of a collaboration. The original article can be found on their Medium page. In low-income countries like mine (Zimbabwe), privatized mobile network operators and Internet Service Providers are the main drivers of internet access in the country. Because of the high cost of living and huge start-up costs when setting up infrastructure, internet access in Zimbabwe is generally pricier than the regional average — leading to major roadblocks in digital innovation. While efforts have been made to lobby the government and promote infrastructure sharing in order to reduce the cost of access in Zimbabwe, the process has proven to be long and drawn out. A feasible infrastructure sharing plan which would see the players who have more resources agreeing to bring down costs seems far away. As someone who comes from a part of the world known in some quarters as “The Global South”, my mother tongue, Shona, is considered a minority language. For this reason, it usually isn’t very high on the “food chain” when it comes time to choose which languages are made available online. In Zimbabwe, economic challenges have meant family members have moved away to different continents altogether. Thankfully, the advent of technology has made communication with families easier, but it has also meant that most communication is now mostly through writing (think Instant Messengers, social media, email etc…). For people whose native language is something other than other than English (or another “majority” language), an extra effort has to be made to interact with applications — something that in itself presents a barrier to many. Countries, such as mine, have not developed new words for a while now and this means that localized terms for WiFi, encryption, and interface (among other tech terms) are virtually non-existent in our language. If technology and the internet are going to make any inroads into developing nations, it is important to understand that technology will only be adopted when the local culture and language are reflected in the interface of the tools we are expected to use. Localization Sprint with Swahili language contributors. Photo by Zaituni Njovu. Used with permission. The work of Localization Lab is an opportunity to create information in local languages for communities that need that information the most. Though Localization Lab’s core mission is the translation of apps for circumvention tech, the space is an opportunity for volunteer translators like me to make a difference by ensuring that in an ever-changing world that continues to be geared towards tech my language survives, continues to evolve and does not disappear completely. Annual and country-specific collaborative translation events — or Localization Sprints — are the building blocks that have helped shape the way I look at how information on the internet is accessed and consumed by citizens in my home country. The Sprints have also enabled me to see that the challenges with language, context, and attempts to bridge the digital divide are not in vain. 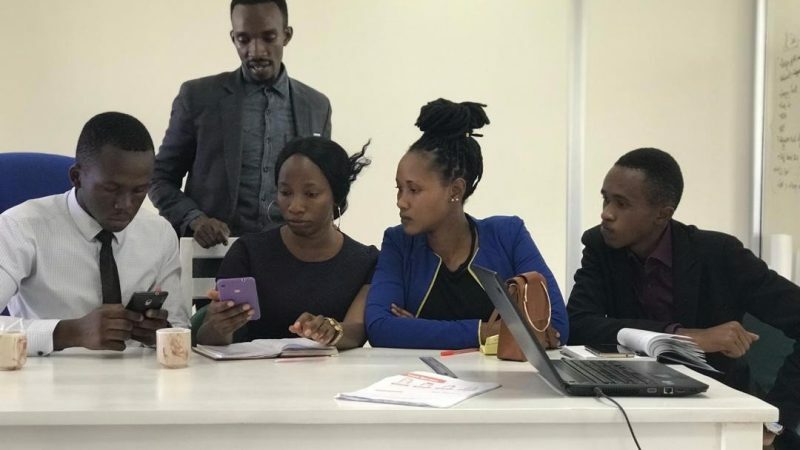 The work done here enables information security, digital literacy, and anyone working in the internet activism space to work towards equipping local communities with digital literacy skills in a language that is familiar and has relatable context. As an information security trainer in Zimbabwe, this aspect is especially important given that we sometimes find ourselves in rooms full of people who have little to no knowledge of very basic Internet concepts and personal digital security techniques. With each training that I have had to adapt, change and play around with to suit the group, I am left with a deeper impression that we as trainers need to have applications and information in our mother tongue. This can only happen if there are people working to translate the information and the applications. The translations are a starting point. A starting point to ensure my mother tongue stays relevant, a starting point to bridge the digital divide caused by language and context, and indeed, the starting point to unlock the potential of my fellow countrymen and women. Indeed all this starts with volunteering to translate applications.